And other things do change, because although Miranda was on a trajectory of focussing on acting (both on stage and screen) and had starred in The Sapphires in 2012 and Love Child in 2016, she had not pursued writing as a part of her career. Then she was invited to Sundance Film Festival for both starring and co-writing the new Aussie film, Top End Wedding, with screenwriter Josh Tyler. The film is a rom-com, set in Sydney, Darwin, and the Top End of Australia, which follows the relationship of a young Indigenous lawyer living in Sydney and her fiancé, an english lawyer who wants to follow his heart and quit working in law. Predictably, the two have very different families (stiff upper-lipped Brits meet Darwin bogans), and yet the film is anything but predictable. Attending the Cannes Film Festival in 2012 with The Sapphires crew was a “pinchable” moment for Miranda, and it helped to cement her presence as an Australian actor with promise not only in the eyes of film critics and the public, but in her own mind. There’s no denying the connection between the film’s script and Miranda’s own life, and Miranda explains that Top End Wedding was close to her heart because it was essentially a love letter to where she grew up in the Northern Territory, and to the people who raised her. When Josh suggested that Top End Wedding be a Hangover-style road trip movie across the Northern Territory, Miranda explains that this gave her the opportunity to show how interconnected all the local Aboriginal communities are in this region of Australia. “I’m a Larrakia from Darwin and was born on that land, but I grew up in Kakadu, which is Mirrar country, and I was on Jawoyn country for school camp,” she explains. 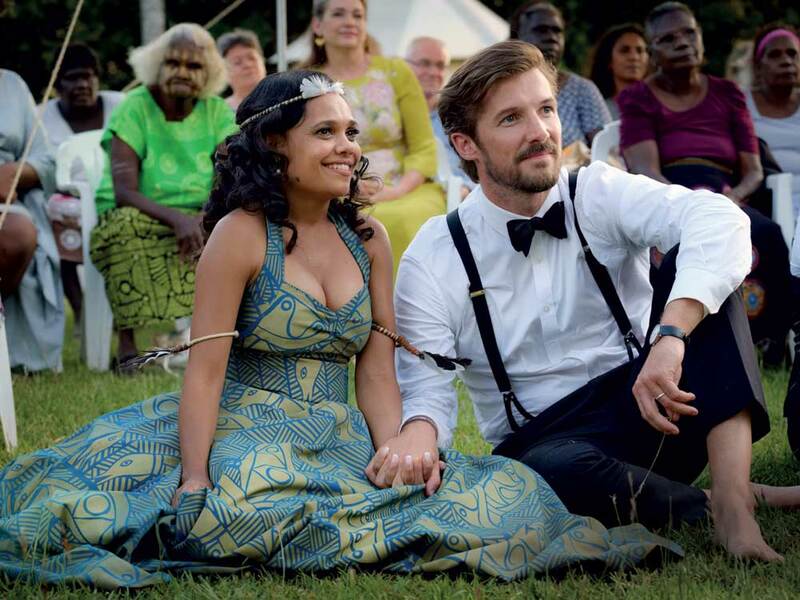 Some of the most touching moments of Top End Wedding are set in the Tiwi Islands, and its where family comes together, and love reigns supreme. The Wangatunga Strong Women are a vivacious group of older women in the film who sing in old Tiwi. “New Tiwi is less formal and has a lot of English thrown into it,” explains Miranda. “They wrote a song especially for Lauren – welcoming her back home with community and family. I was incredibly touched by this and I’m thrilled that it’s in the film. ”Having Aboriginal women, young and old, celebrate who they are and what makes them unique means a lot to me. What they have to contribute to this country is incredible, valid, and should not go unrecognised. Of course. That’s what makes her Miranda.